Nowadays, most (over 50%, according to a research) prefer to use digital methods, maybe a streaming video subscription to purchase or rent movies or TVs. However, this research also says that 41% people use both digital and physical methods, and 20% insist on physical DVDs only. Also we can see the popularity of DVDs from DVD sales in United States of 2016. To sum up, digital is popular while DVD disc isn’t dead. There’re also countless DVD enthusiasts. They love DVD discs, but meanwhile enjoy converting DVDs to MP4. After all, they will get a digital copy which is easy to manage on virtually all electronic devices, and helps keep their discs away from mishaps. So here we will hold out 2017 best 3 DVD to MP4 converter free software for Windows users (some are available for other platforms as well) and explain workflow one by one, to help you rip both unencrypted and copy-protected DVDs to HD MP4 without quality loss and without spending a penny. 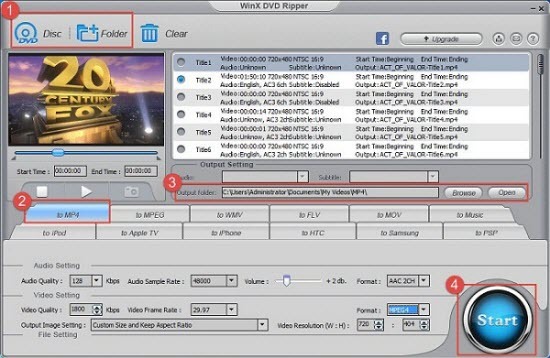 WinX DVD Ripper is a totally free DVD to MP4 converter for both 32 bit and 64 bit Windows computer. And it has a Mac edition. After years of continuous development, it becomes an expert in DVD ripping, featuring fast DVD ripping speed, high-quality output, decryption ability to remove various copy protections alone, broad compatibility, and so on. In addition to general MP4 profiles offering two available video codecs – H.264 and MPEG4, it also provides a number of premade MP4 profiles for iPhone, Apple TV, iPod, Samsung, PSP and HTC. Therefore, the resulting MP4 file will be fully compatible with users’ device without modifying settings. How to free convert DVD files to MP4 with WinX DVD Ripper? To begin with, download and install this free DVD to MP4 converter on PC. And then 4 steps later, you’ll get a MP4 copy with everything you need. Step 1. Open WinX DVD Ripper, and then click on “DVD Disc” or “DVD Folder” button to load target DVD file. Step 2. Navigate to output profiles tabs, hit “to MP4” or choose a MP4 profile under certain device profile tab. Step 3 (optional). Change default output settings if you think it is necessary, for example, subtitle track, output folder, audio/video bit rate, sample rate, video resolution. Besides, this DVD to MP4 converter free software allows trimming video to cut off unwanted part. Step 4. Click on “Start” button to begin processing DVD to MP4 conversion. Handbrake is another time-honored free and open source video transcoder that can convert videos, blu-ray and DVD discs to MP4 and MKV. Before Christmas 2016, Handbrake team took out Handbrake 1.0.0 which has got major improvements. It adds general presets, and presets for web and devices, while keeping legacy presets. Handbrake is an ace free DVD to MP4 converter in terms of ripping unencrypted DVDs. As for converting copy-protected DVDs to MP4, it is far weaker than WinX DVD Ripper. It can only rip CSS-protected DVDs even if VLC libdvdcss is installed. How to free rip DVD to MP4 with Handbrake? Likewise, you need to download and install Handbrake first. Go to https://handbrake.fr/downloads.php, and get the proper version downloaded. Next, following the guide below. Step 1. Run Handbrake, hit “Open Source” to load the DVD you want to convert to MP4. Step 2. Set destination folder to save output and choose MP4 as container. Step 3. Hit “Start Encode” to order this free DVD to MP4 converter to start conversion. Free DVD Video Converter is a Windows-based tool specially designed to convert Blu-ray discs and video DVDs to MP4, AVI, and MKV video for iPhone, Apple TV, iPod, PSP, PS3, BlackBerry, Xbox and computer. But just like Handbrake, this free DVD to MP4 converter software can rip unprotected files only. Another important thing is that it is ad-supported. It includes links to other websites and third-party apps installations including toolbars. Luckily, it allows you to uncheck them while installing. So be careful in the process of installation. How to convert a DVD to MP4 with Free DVD Video Converter? Again you should download and install it first, and then move to the next thing. Step 1. Double click on the icon of Free DVD Video Converter to open it. You’ll see the screenshot is very straightforward. Browse and select target DVD. Step 2. Hit “Choose” to select title, audio and subtitles. Hit “Browse” under “Output file” to name a location. “MP4” under “Formats” and choose a preset. 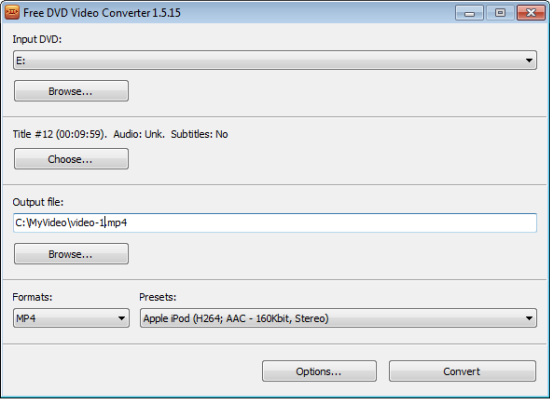 Finally, hit “Convert” to begin converting DVD to MP4 at no cost. Changes are inevitably acted on raw videos. Stock video footage coming from HD/4K camcorders produce troubles when either to upload for sharing on YouTube, Facebook, Instagram…or transfer to portable devices for movable playback because of undesired giant size. We have to compress original video making it fit network transportation or better play on more screens. Online video compressor is recognized as the most convenient solution to compress and reduce video file size. It is free, effective and easy to use. But how to judge whether a video compressor site is serviceable or not? Here, we give a chart of top 3 free online video compressors of 2017. Clipchamp is a rising star which aims to offer the easiest solution to convert/compress videos and record webcam videos free. It supports a large range of input video formats like MP4, AVI, WMV, FLV, MKV and more. Instead of specific output video formats, it gives 4 profiles, Web, Windows, Mobile and Animation (GIF), which include the optimal video formats which deliver smaller size of original video but keep good quality. Besides, users are allowed to set video resolution, quality and trim videos to shorter for reducing video file size. After the compression process is done, user can directly upload and share online or save to hard drive. • It is easy, free and fast. No ads on page. • It provides customize settings and editing tools for further video compression. • Video formats are limited. • User must log in with an account to access to video compression. 1. Open cinpchamp.com and hit COMVERT VIDEO FILE button on its home page. 2. Continue with Google, Facebook account or register one. 3. Upload one or more video to this online video compressor. 4. Select one profile (Web, Windows, Mobile, or Animation) and set/edit video according to your needs. 5. Click Start to compress video. Once it is completed, you can select UPLOAD & SHARE online or SAVE to computer. Convert.Files is a web-based application to convert and compress videos without registration. Like Clipchamp, it is available to input and output almost all mainstream video formats like MPEG4, H.264, AVI, WMV, MOV, MKV, FLV, 3GP. 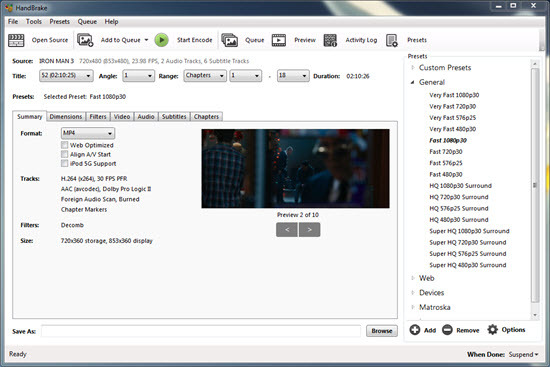 It also enables to extract audio tracks from video files. Apart from compressing local video, it enables users to download from online and shrink it to other formats for mobile playback, email delivery or other purposes. Not only working as an online video converter and compressor, it is an all-in-one file converter which can perform conversion between audios, e-books, images, documents and more. • No account is needed! Free and easy-to-use! • Abundant video formats allow us to select the best format to compress video to. • So many ads adhere to the page. Some confusing one may mislead us. • The resulting video file may be corrupted and cannot be opened. 1. 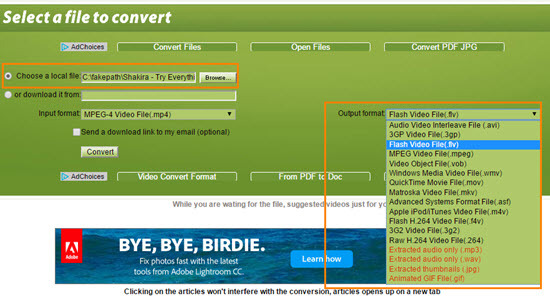 Open convertfiles.com and click Browse to choose a local video file you want to compress on its home page. 2. Input format will be auto checked. Now, select output format. If you want to compress video for email or web, FLV and 3GP are recommended. 3. Click convert. The video will be uploaded firstly and converted next. 4. After all is done, a download page with a download link will be given to you. Select “Save Link As” to download the compressed video. Zamzar integrates with hundreds of converters to support various conversions, including video, audio, image, e-book, document etc. It is definitely an online expert on video compression. It embeds much more video formats (codes) than other two free online video compressors, not only containing general video formats, H.264, MP4, AVI, WMV, MOV, FLV, 3GP, WebM etc, but devices profiles iPhone, iPad and iPod. It also offers an URL converter helping users directly convert and compress online videos to other video/music formats. • It supports most output video/audio formats and additionally provides devices profiles. • Ads on page are quite annoyed. • It is only free for compressing videos smaller than 50MB. • It requires email address for compressed video download. And, you cannot receive email immediately but wait for several hours even more. • It delivers slowest conversion speed among top 3 free online video compressors. 1. Open zamzar.com. Click Choose Files… button in Step 1 to upload video from hard drive. 2. 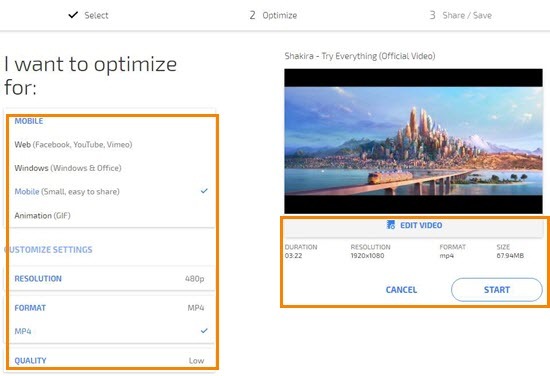 Select an ideal video format which can make video to be greatly compressed from “Convert files to:” drop-down list in Step 2. 3. Input your email address into text box in Step 3. 4. 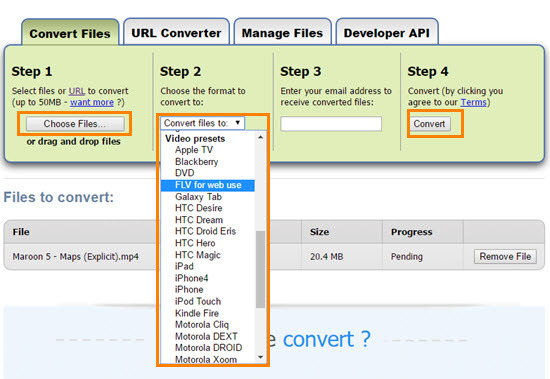 Click Convert button in Step 4 to start compressing videos online free. What Is the Best FFmpeg Alternative? Do you want an FFmpeg alternative for video conversion? What’s the best FFmpeg alternative? Follow us! We will introduce the greatest replacement of FFmpeg, explain why it deserves downloading and show the detailed user guide for you! FFmpeg works with command line to transcode videos, for example “$ ffmpeg -i input.avi output.mp4“. Yes, it seems a little complex for novices. But we believe that veteran FFmpeg users can well understand how to write command line to well complete encoding, decoding tasks. But sometimes, sorts of errors arrive as well. It outputs an empty file; the input file is invalid; the resulting MP4 file cannot be played over internet or devices; and so on! Actually, the cumbersome operation and unknown errors force some users to seek for a more convenient and solid alternative program to FFmpeg. What’s the Best FFmpeg Alternative? Open WinX HD Video Converter Deluxe. We can see a straightforward interface where every button is arranged neatly leading us to fully understand how to use it without guesswork. Besides ease of use, it features fast conversion speed. Armed with Hyper-threading tech, Multi-core and Hardware (Intel QSV, MMX-SSE, Nvidia CUDA/NVENC) encoder support, it can reach up to 5x faster speed than other video converters in the market. What’s more, it uses High Quality Engine and Yadif Double Frames” De-interlacing Engine to optimize quality of output file. E-book, this digital form of book publication, is proved to be extremely successful with a fast growth in recent years not only thanks to its native portability, lower prices (even free), but development of reading technology, software and devices. Internet is absolutely a resourceful library treasuring up billions of books in any genre. Amazon, eBay, iTunes and other similar online stores are great places to explore e-books. But where to get free e-books? If we want to download free e-books for iPhone iPad, how to do? Let’s unveil answers one by one. 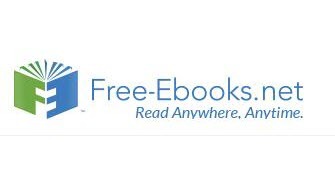 Hundreds of free e-book download sites swarm into the market supplying lots of freebies. But, book limitations, security problem and some other errors of a part of sites may disappoint you. Here, we would like to introduce top 3 sites for free e-books download which collect diversified books in different formats and deliver green downloads. 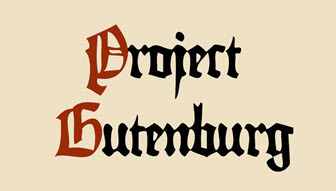 Gathering over 53,000 free e-books and continuously adding new items, Project Gutenberg is the first recommendation for e-books free download. Every e-book is given in several formats, like EPUB, Kindle books, TXT in order to fit different devices. You can directly read book online or free download wanted format to hard drive or send to Dropbox, Google Drive, OneDrive. Book Search Page allows you to find a book with keywords or get popular/latest/random books, while Book Categories page can help you browse books from specific genres. Open Free-Ebooks.net. An obviously category list is displayed. Then, scroll down to access to other book lists: Featured eBooks, Best Books, Great Book Lists (including Christmas Books, Best Books 2016 etc. ), Latest Arrivals and Latest Audiobooks. You can explore books from those categories and lists on home page or search by author or title to get the book what you want. This free e-book download site also offers several formats for one book, PDF, EPUB, Kindle and TXT. But, you need to register to achieve e-books free download. 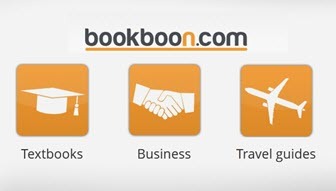 If you are a student or business professional, Bookboon is the greatest place offering useful free e-books. It embraces learning books on various ranges, from language to IT, economics to natural sciences, personality development to social skills and more. Almost all books are in PDF format which is compatible with Kindle, iPhone, iPad and lots of e-book reader software. To download a free e-book from Bookboon, you need to give some information at first, like e-mail address, studying/working, professional/study program. Besides above-mentioned best free e-books download sites, torrent sites also collect a large number of e-books in torrent format. You can probably find any book on those sites but also face security and copyright problem for e-books free download. It is pretty easy to download a free e-book from online book libraries. Enter one book page. Some gives a download button to access to format list while some directly lists available formats. 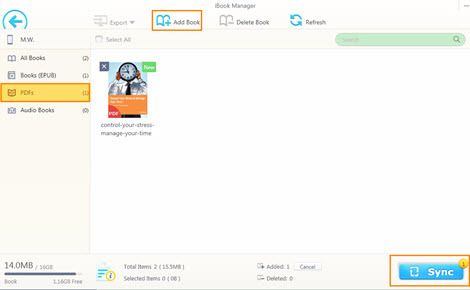 Select one format and the book will be downloaded automatically. If registration is required, do it! Now, free e-books are downloaded to hard drive. Next step is to transfer them to iPhone iPad. Instead of iTunes, we highly recommend making full use of WinX MediaTrans, an easy-to-use iOS file transfer program capable of adding PDFs, EPUBs, audiobooks from computer to iPhone iPad with ease. It delivers a fast speed for batching transferring and will never make any data disappear from your devices. It is fully compatible with devices running on iOS 7.0 and later, including latest iPhone 7/Plus. Please download and install WinX MediaTrans on your Windows (10) PC and follow the steps to transfer free e-books to iPhone iPad. Step 1.Make sure that iTunes was installed (once) on your computer. Plug in your iPhone/iPad to PC. After launching WinX MediaTrans, main interface with function modules will appear. We would like to ask you to prevent iTunes auto-syncing. Open iTunes and get Preferences from Edit menu. Hit Device and check “Prevent iPod, iPhones, and iPads from syncing automatically” option. Step 2. Click Book module. A new page for e-books transfer appears. Hit Add Book button to important downloaded free e-books to this page. According to the format, e-books will be automatically assigned to Books (EPUB), PDFs and Audio Books category. Step 3. Click Sync on the right bottom of this page to transfer e-books to iPhone iPad. If you don’t want to sync one or certain e-books, click “X” symbol on the right corner of each book cover to cancel transferring before hitting Sync button.